Introducing Georgia Grinders with Peanut Butter Chocolate Truffles | We Like to Cook! National Peanut Butter Day seems to be the perfect occasion to introduce the recently launched line of hand-crafted “Georgia Grinders” Peanut Butters from Georgia native, Jaime Foster, whose “NaturAlmond” Almond Butters were featured on Oprah’s popular O-List in August 2013. These artisanal peanut butters, available in both Creamy and Crunchy varieties, are made with two simple ingredients, the finest quality NON-GMO, Georgia-grown peanuts, and sea salt. The peanuts are hand selected, slow roasted, and then ground to Foster’s ideal consistency for the ultimate fresh peanut butter experience. To showcase the versatility of her peanut butters, Foster engaged Chef Ryan Smith of Southbound restaurant in Chamblee to craft sweet and savory dishes featuring her peanut creations. The chef met the challenge and offered chicken satay with peanut sauce; steamed spinach goma-ae with sesame sauce; grilled peanut butter and bacon sandwiches with tart jam; and, peanut butter brined pork belly with apple peanut compote to hungry taste-testers. 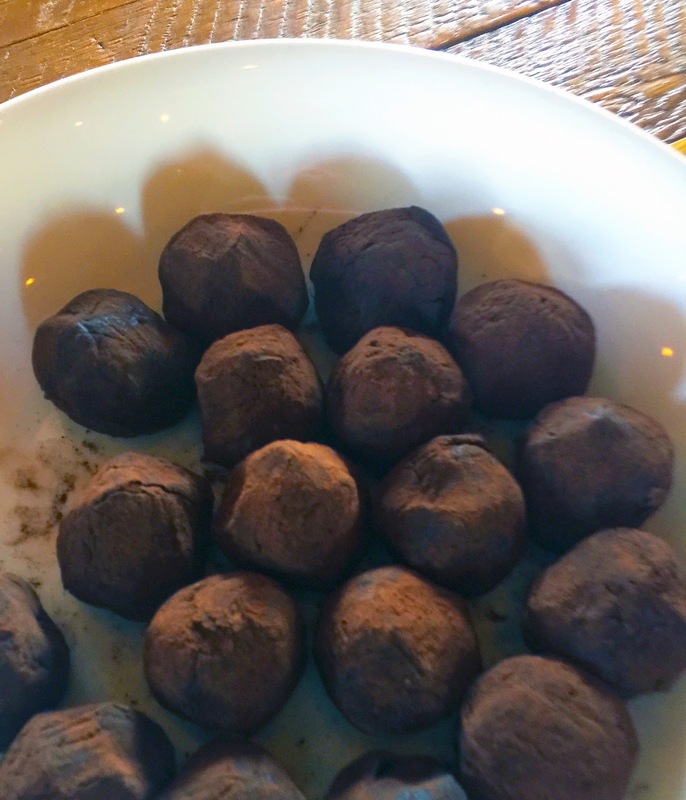 The pièce de résistance, however, were Peanut Butter-Chocolate Truffles rolled in rich, dark cocoa powder. You can imagine, our glee when we learned that Chef Smith would share his recipe with eager samplers. Of course, we must share with you too – just in time for Valentine’s Day! In a sauce pot, bring the cream, butter, sugar, and salt to a boil over medium heat. Stir until sugar is dissolved. Reduce heat to low, and then add the chopped chocolate pieces, and peanut butter stirring over low heat to melt the chocolate. Stir in espresso and vanilla before pouring into a dish to cool. Allow to cool completely before forming 1” balls size and roll in powdered sugar or cocoa powder. 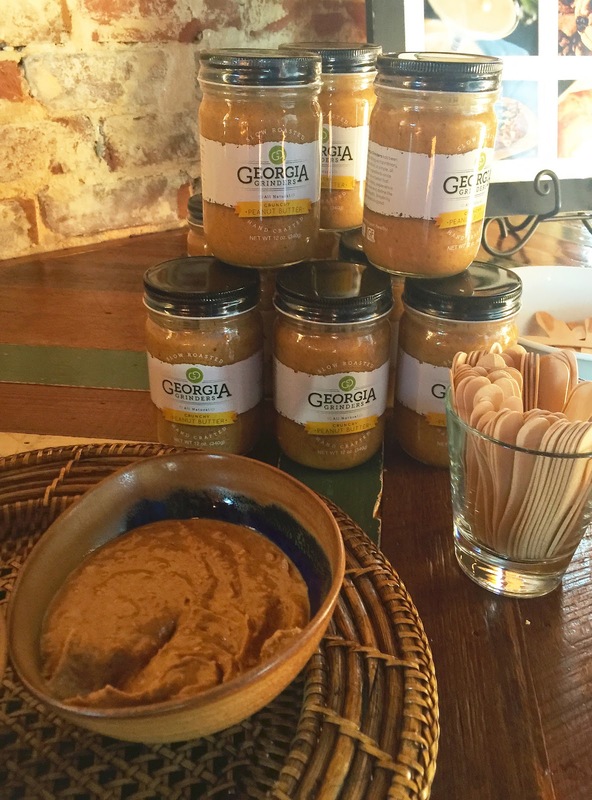 Georgia Grinders Peanut Butters, which are sold in 12 ounce glass jars, will be available starting this month in regional Whole Foods, Sprouts Farmers Markets, Central Market Stores as well as gourmet specialty shops. For more information about Georgia Grinders, please visit their website at www.georgiagrinders.com. While the items we sampled were complimentary, I received no additional remuneration. The opinions included herein are honest and unsolicited.